Sometimes, it’s easy to get wrapped up in lifting heavy weights. With kettlebells, barbells, medicine balls, and so much equipment available, it’s easy to discount how effective a bodyweight workout can be. Let’s think about it for a minute. Does it really matter how much you can deadlift or how many heavy kettlebell swings you can do if you can push up your own bodyweight? The basics are good, and we cannot overlook them. Becoming efficient at moving the weight on your body is important. For today’s workout, we are trading the weights for a good old fashioned bodyweight workout utilizing basic exercises. One great thing about a bodyweight workout is that you can do it wherever you are. Really, this is the beauty of a workout that doesn’t require any equipment. This workout can be done at the park, in the garage, in a hotel room if you’re traveling, or in your living room. This workout consists of three separate sets. You will complete reps of 20 for each exercise. Complete each set three times before moving to the next set of exercises. Excuses are so easy to make. We don’t have enough time, we are too out of shape, this hurts, that hurts, we ate too late, we are tired, blah, blah, blah. Today, focus on making a way and shut your excuses down. Crank up your Spotify, lace up your shoes, and just get this workout done. If you are battling kids, get them to join you. Maybe talk your spouse into getting sweaty too. Either way, let’s work on getting efficient at moving your own body weight. 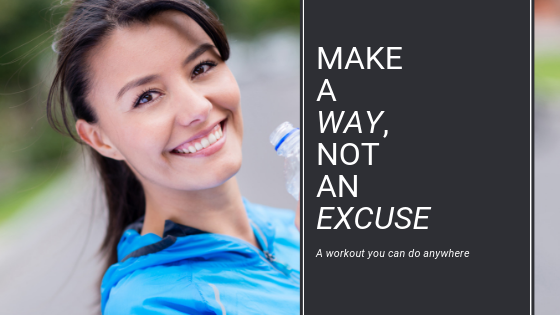 Need some accountability to help you stop making excuses? Check out Fixed on Fitness. You can always try a week for free.